I don’t think i ever remembered to post photos of our apartment. We moved here about a year ago and spent about a month redecorating. 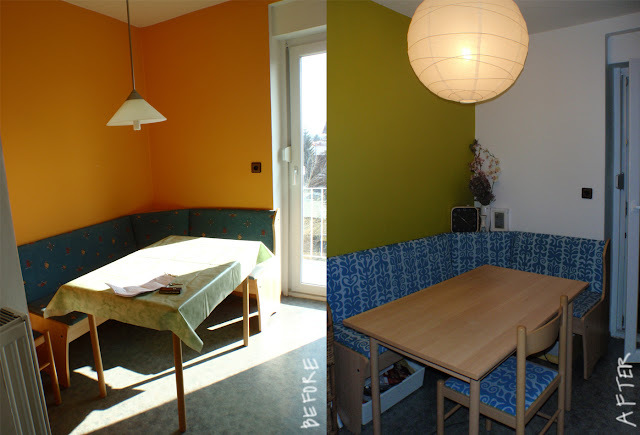 Yeah, i was never the one to be able to live wherever so we had to paint the walls, reupholster furniture, take a trip to ikea, put in new shelves/lights. Of course i already hate it and want to redo the whole thing or move. However…the budget won’t stretch that far so i’m stuck with what we’ve got. Unfortunately only the photo of the kitchen is worth posting but i promise to cover the rest of the flat later on…. Važno je da živiš po svoje 🙂 vse ostalo povezano s kešom bo že še prišlo! Da ti da malo barve in dekoracije boljše počutje, je že veliko!